This weekend hmv launches its first ever Comic Week, a week-long celebration of comic book characters in stores across the UK with loads of price drops on graphic novels, exclusive titles, free goodies and the chance to get your hands on some exclusive early releases. Few animated characters have caused as much of a buzz in recent years as Rick and Morty, the mad scientist and not-so-mad grandson duo created by Dan Harmon and Justin Roiland. The series has been so popular it has even spawned its own comic book series, featuring artwork by the likes of CJ Cannon and British illustrator Marc Ellerby. How did you find your route into becoming an illustrator for comic books? Did you know early on in life what you wanted to do? "I was always that kid who drew all the time, at home and at school I was always drawing. My dad would bring home reams of old printer paper from his work and I would just sit and draw like the Ninja Turtles or Super Mario for hours. Wanting to draw and making a living from it are two different things and don't always go hand in hand but I figured if someone is getting paid to draw comic books then why can't I?" "It was probably when I was doing my National Diploma in Art and Design where I opted for Graphic Design that I realised I wanted to draw more than I wanted to be a designer as I just wasn't interested in the briefs we were being given, I liked storytelling and mark-making so about halfway through the year I switched to the art side but focused on becoming an commercial illustrator and eventually went to uni where I studied Illustration." What kind of comics/artists inspired you when you were starting out? "I think Bryan Lee O'Malley's Scott Pilgrim probably had the biggest effect on my life. When it came out in my 20's there was nothing else like it and it had so many elements that I loved at that time, a mash-up of indie comics, manga and video games with indie rock bands and romance! It looked fantastic, his drawings were how I wanted to draw but I was nowhere near that level, and to see how much he improved over the six volumes blew my mind. Sure there are other comics and artists that I've long admired but Scott Pilgrim was truly a game changer." What was your first paying gig, so to speak, and how did you land it? "I think my first paying gig was a comic in a Belle and Sebastian graphic novel called Put The Book Back On The Shelf? Which is a weird subject for a comic and also a weird title for sure. It was an anthology of comics based on Belle and Sebastian songs published by Image Comics in the mid-2000s. The short story I illustrated was written by Jamie S. Rich and I did a very bad job drawing it so please don't go find it, but from that gig, I managed to get a few more jobs and kept building on that workload and relationships with editors and art directors." Can you give us an outline of your working process? Are there any digital processes involved or is it all drafted by hand? "So I used to draw everything in pencil and ink on proper paper, but as the turn around on Rick and Morty is so quick I found I was starting to struggle so invested in a fancy iPad Pro and Apple Pencil. Now I work exclusively digitally from roughs to final line art and as I'm working on my iPad I can work anywhere I want, so it's great for when I'm travelling for conventions I can still work on the train or at hotels which I couldn't before as my drawing board is flipping heavy. "For an interior comics page, I usually start with a rough sketch of the layout where I plan where the panels are going with quick character sketches, from there I'll move onto tighter pencils which then have to be approved by Cartoon Network. Once they've approved them or asked for changes I then move onto inks before handing it over to my colourist Sarah Stern who digitally applies the colouring." How did you become involved with the Rick & Morty comics? "Well, coming back to the Belle and Sebastian comic, the writer of that short story Jamie S. Rich was putting together a graphic novel series called Love The Way You Love published by Oni Press, this is the same Oni Press who produce and publish the Rick and Morty comics in the States. I draw quite similar to the adult swim style so when Oni got the license to produce the comics they asked me if I would be interested in working on the book and because I was a huge fan of the show already I said yes. I believe they got the license quite soon after season 1 had ended so it really wasn't the pop culture behemoth it is now, I think they were the first or second Rick and Morty licensed product ever. I only got the job because the publisher and I had a working relationship already in place." Does your approach differ much when you're working on characters created by someone else, compared to working on your own creations? "The only difference I've found is the approval process is so much more involved, obviously because you're playing with someone else's characters. But other than that for me, it's just drawing, it's the same mindset. 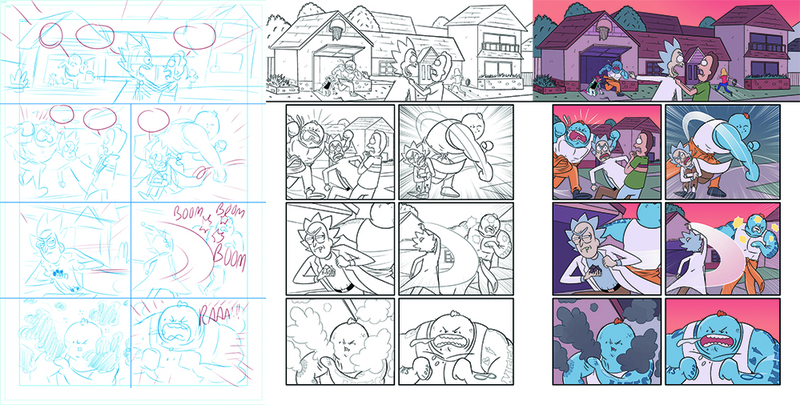 Because my style is so close to Rick and Morty anyway it's really not a stretch to get the house-style correct. The only thing that trips me up is probably all the spaceships, tech, weapons etc from the show as it's not something I've had much experience in drawing before." Do the writers have much artistic licence with those stories, or do they tend to be based on the TV episodes? "Even though the show is pretty out there we are reigned in a little bit of what we can and can't do but overall we have quite a lot of freedom. We tend to mix it up a little so some issues will maybe spin-off from an episode or feature a supporting character but for the most part, we're telling original stories set in the Rick and Morty world." What are you working on besides Rick & Morty? Anything you're really excited about? "My life is entirely made up of drawing Rick and Morty comics, there is no time for drawing anything. It's just me drawing those two boys for a hundred years. I would love to get back to working on my own comics again and it's something I'm actively looking at doing but I also don't want to give up drawing for one of the biggest properties on the planet." Aside from your own work, what other comics or graphic novels have you been getting into recently? "I've been a bad reader recently, I've sort of let everything slide a little but my favourite comic of the past few years is Giant Days, written by John Allison and drawn by Lissa Tremain and Max Sarin. It's about three friends at a British university. That's it! But it's so good and incredibly funny. "Be Prepared by Vera Brosgol was really quite excellent, it's an autobiographical story about her experience going to a Russian scout camp in the States. The cartooning in that is brilliant. I also read the latest volume of Saga which made me do lots and lots and lots of gasps and big swears whilst reading it. It's very good but also incredibly heart-breaking?!" Are there any upcoming graphic novels or comic series you're really looking forward to? "I'm really excited about Lucy Knisley's graphic novel about her pregnancy called Kid Gloves which is coming out in 2019 from First Second. I think that particular publisher is bringing out a lot of the releases I'm most looking forward to like This Was Our Pact by Ryan Andrews. It looks to be a little Goonies and a little Miyazaki, like there's a bear in a roll neck in it? It looks beautiful."